Some people you just connect with. Sometimes you meet a person and you're like wow, we have so much in common. That's what happened when I read Brad Paisley's Wikipedia page. Let me explain. He writes hit songs that are played on the radio for millions of people and I write for a blog called just pmsing dot com that only my father and middle school teacher read. We are both writers!!!!!!!!!!! I love my tweets, Brad Paisley loves my tweets, we both love my tweets. Sometimes he even interacts with them and I also interact with my own tweets. Just two people with so much in common. Wow. Incredible. Ever-changing but staying the same. Moving. On Brad Paisley's Wikipedia page, it states that he went to high school and wow, so did I.
Steve Martin. Martin Short. Diane Keaton. Kimberly Williams-Paisley but just Kimberly Williams then. I love that movie. I love the house in the movie. I love Kimberly Williams' character's gay fiance in that movie. I love her bushy eyebrows in that movie. I love when the little brother is in charge of valet during the wedding. Man, such a great movie. And Brad Paisley likes it too!!! It's the movie that made him fall in love with his wife!!!! BP and I would be such great friends. Just sitting and watching Father of the Bride. Man, so much alike. hahahahahahalolololeloheltehehahahhehe. OH, YEAH! WE BOTH HAVE GAY EXES!!! 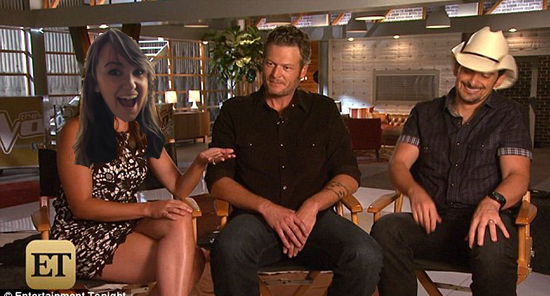 Just Brad Paisley and I sitting with some beers talking about that time we dated gay people, just laughing up a storm. Hahahaha. It's so funny, we would say. Man, how did we not see it, he would say. I don't know, pass the beer, I would say. Hahah, gays, we would say.